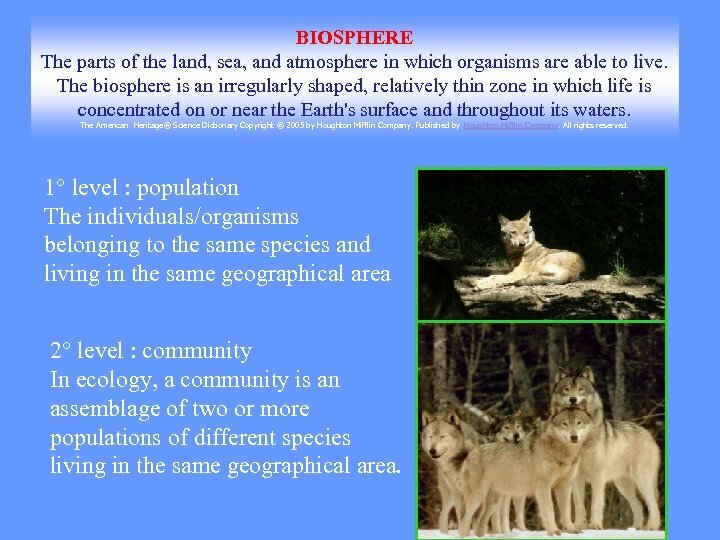 BIOSPHERE The parts of the land, sea, and atmosphere in which organisms are able to live. 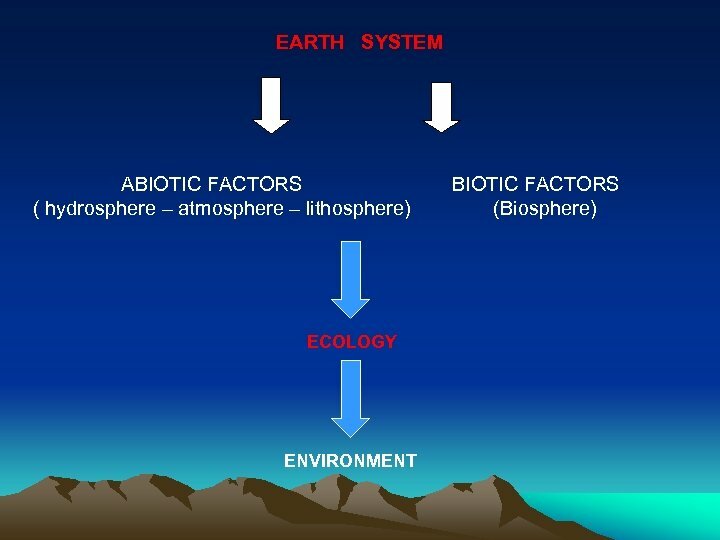 The biosphere is an irregularly shaped, relatively thin zone in which life is concentrated on or near the Earth's surface and throughout its waters. The American Heritage® Science Dictionary Copyright © 2005 by Houghton Mifflin Company. Published by Houghton Mifflin Company. All rights reserved. 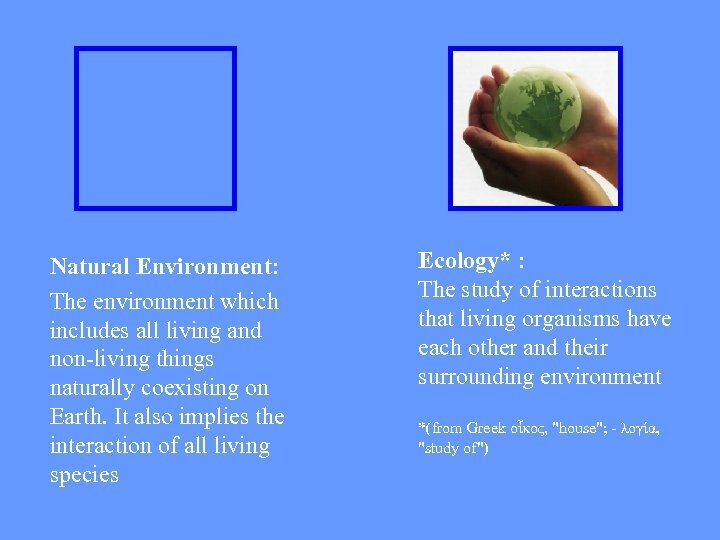 1° level : population The individuals/organisms belonging to the same species and living in the same geographical area 2° level : community In ecology, a community is an assemblage of two or more populations of different species living in the same geographical area. 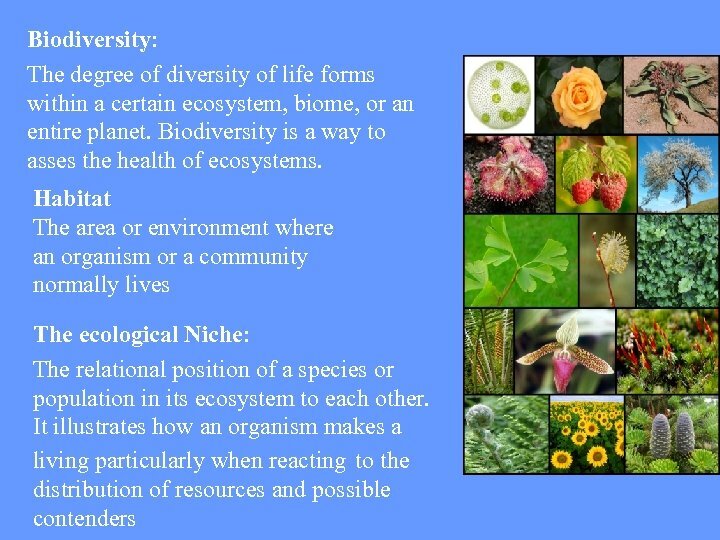 3° level : ecosystem is the biological environment which consists of all organisms living in a particular area, as well as the physical elements such as air, soil, water, and sunlight with which those organisms interact. 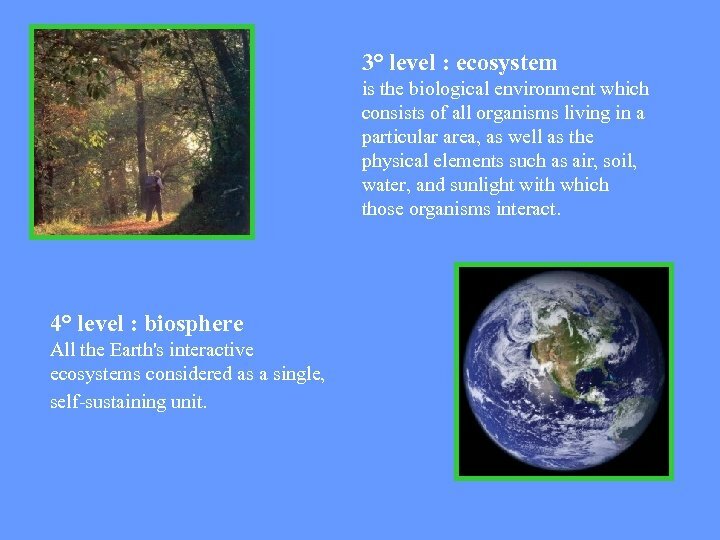 4° level : biosphere All the Earth's interactive ecosystems considered as a single, self-sustaining unit. 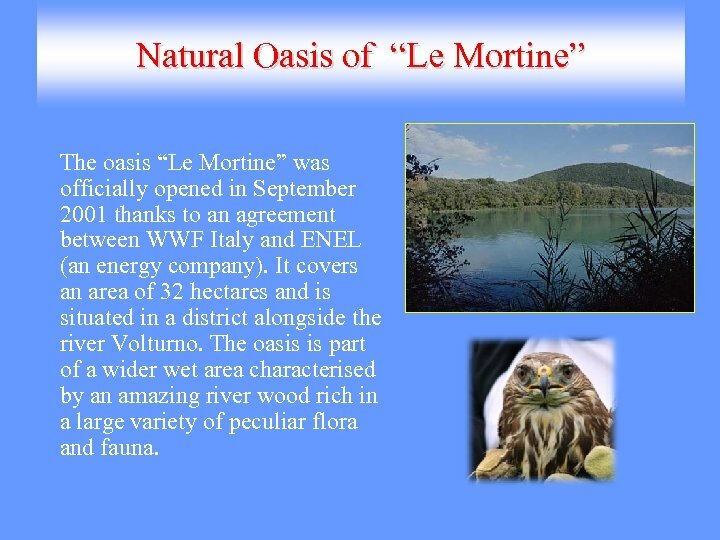 Natural Oasis of “Le Mortine” The oasis “Le Mortine” was officially opened in September 2001 thanks to an agreement between WWF Italy and ENEL (an energy company). 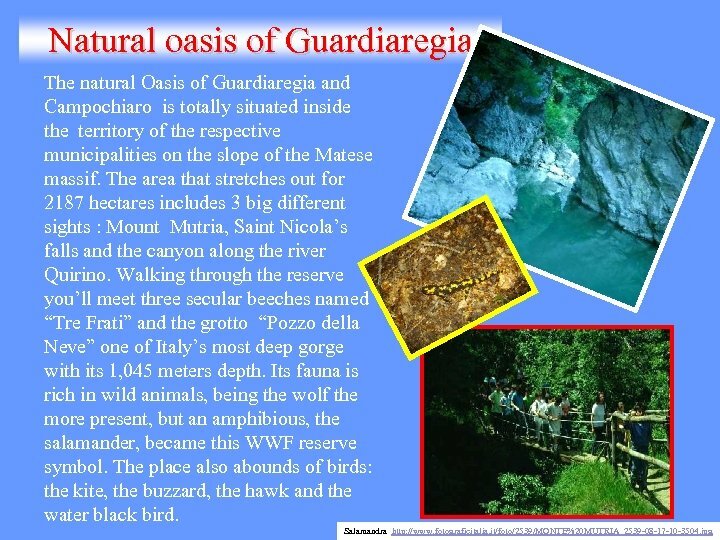 It covers an area of 32 hectares and is situated in a district alongside the river Volturno. The oasis is part of a wider wet area characterised by an amazing river wood rich in a large variety of peculiar flora and fauna. 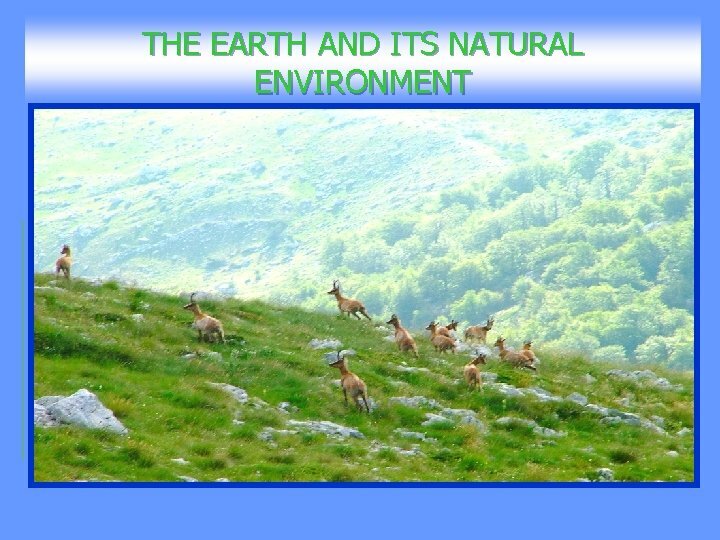 Regional natural reserve of Punta Aderci is a naturalistic reserve which safeguards the most important coastline of the region Abruzzo, from a naturalistic point of view. It stretches out for about 5 km of coast, covering an area of about 285 hectares. 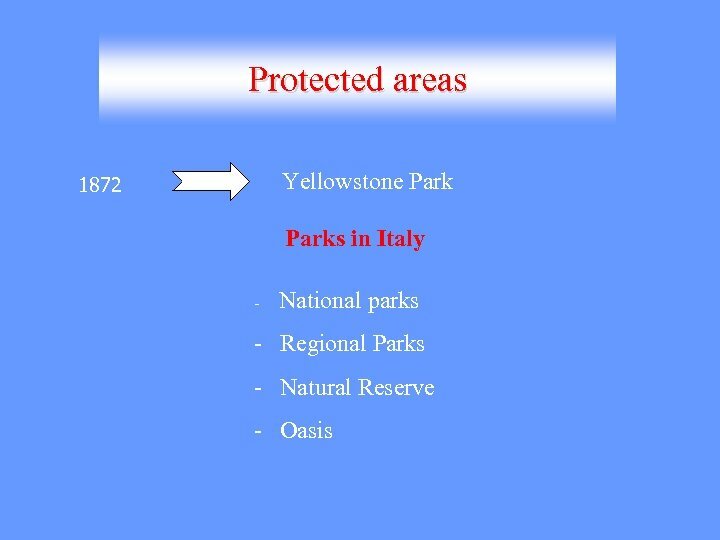 This wonderful reserve consists of a series of sandy and stony beaches, rural landscapes and Mediterranean maquis, green and blue sea, unspoiled dunes and stunning colourful sunsets brightening the back of the mountains of three National parks, Maiella, Gran Sasso and Monti Sibillini. Punta Aderci is to be discovered step by step, by walking, cycling or simply enjoying the quietness of its seashores. 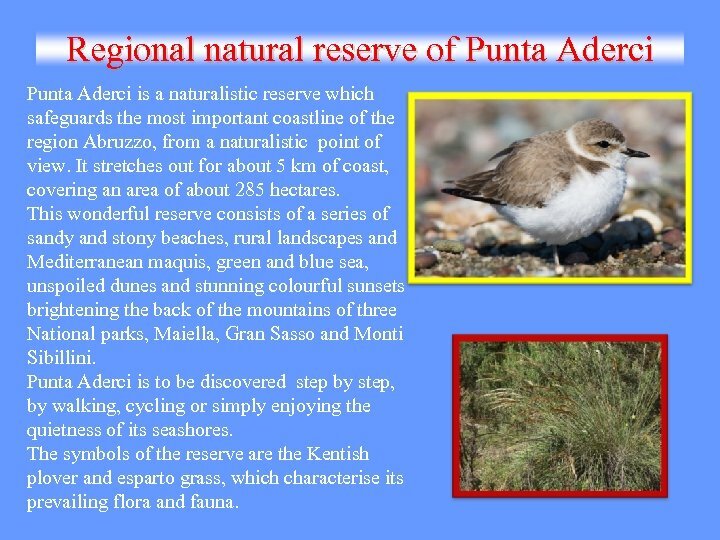 The symbols of the reserve are the Kentish plover and esparto grass, which characterise its prevailing flora and fauna.